Thrissur district known for its wide varieties of cultural activities, valued throughout the state as the cultural capital. The reason being why it was named is because of immense number of traditional heritage events organised and maintained. The place is also known to have largest number of temples than any other district. Kerala Kalamandalam is a perfect example for the people which maintains the proud name. Yet another event which calls people from different parts of the worlds to reach the city is Thrissur pooram. Keralites, especially locals from Thrissur worldwide has this title uplifted to their district. Trichur Pooram is a cultural festival conducted annually at the time of Medam in malayalam calendar. This year, it is organised on 5th of May. Two renowned temples in Kerala conducts this auspicious moments namely Thiruvambadi Sri Krishna temple and Paramekkavu Devi temple. The celebration is widely known by the name “Mother of all Poorams” and it lasts for more than a day and ends with the pakal pooram, the coming day which is considered their actual festival date by the locals. Cheru Poorams from 8 temples which includes Kanimangalam, Karamukku, Choorakkattukara, Laloor, Ayyanthole, Neithilakkavu Chembukkavu and Panamukkampilly joins in the midst of the main festival to pay honour to the presiding god, lord Shiva or also known by the name Vadakkumnathan. The city will be crowded with numerous people from various parts of the world to witness the spectacular features that fills the celebration. Those who visits Thrissur also comes to Guruvayur to receive the blessings from the lord Sri Krishna. Bhasuri Inn is a pre eminent hotel in Guruvayoor which offers 5 star accommodation for the people in Guruvayoor. Thekkinkadu maidanam is a lush spacious ground surrounding the Vadakkumnathan where the events are organised. Thiruvambady commences the celebration by heading towards the temple with a team of artists and elephants affixed by golden head pad. Paramekkavu team too enters the arena with same strength to reach near the Elanji tree inside the premises of the temple. The artisans will be playing a set of instruments at this time. Both the groups will be present near the Thekke gopura nada, facing each other with their teams to showcase their respective artworks in umbrellas. Kudamattam will be filled with numerous colours and styles to conquer the minds of millions standing in the spot. It can also be viewed during the pooram exhibition at any time before the actual date of festival. People will wait for the fireworks held by the two teams on the same day, late in the evening. After Kudamattam, Vedikettu is the most highlighting feature in Thrissur pooram. Each of which will blast from the sky and displays vibrant colours that fills the eyes of thousands viewing the event. Utmost care has been taken by the authorities in handling the explosives. The celebration will come to a conclusion after the vedikettu held on the next day which is called pakal pooram. It is considered the real celebration period for the people of Thrissur. Atlast Upacharam Cholli Piriyal (farewell ceremony) will be conducted by both the teams. 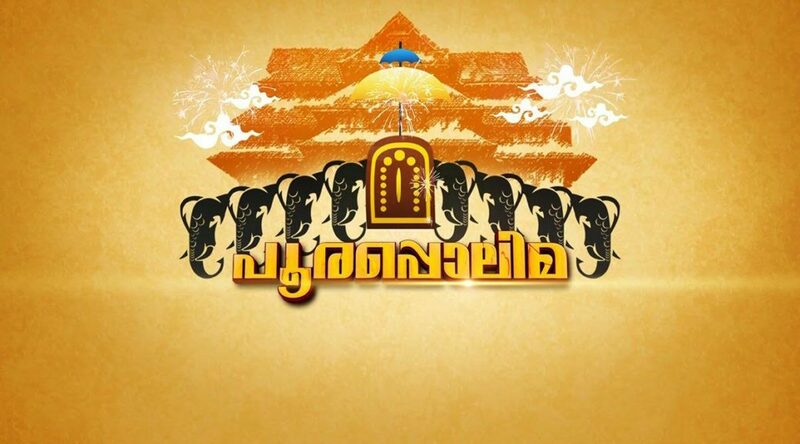 Elephant leader of each group bows their trunk to each other and says bye till next pooram awakes the coming year.